Allow me to be entirely honest. The posting for this recipe is a little premature — I've only tested it twice and can't guarantee 100% that you'll get the same awesome flavor I got when I made this last. But I wanted to share the recipe anyway, for those who are up for culinary adventures and may enjoy being recipe testers. If you try it? I would love to hear how it turned out for you. The trick, I think, is to use a mild curry powder. If you do use hot curry powder, I would reduce the amount to about half — you can always add more to taste if the overall flavor is too mild for you. Also, before I list the recipe, an upcoming thing I'm excited to mention: a small behind-the-scenes look at Tuesday night's gathering of the Recipe Trail Club, hosted this time around at my place. The Recipe Trial Club is made up of myself, Mattie Hagedorn, Dawne Eng and Terry Hope Romero. The four of us have been getting together once a month to help each other test-run and taste-test recipes. This month, my vegan foodie partners in crime gave me feedback on a new seasonal Sweeties cupcake recipe I've developed: Spiced Pumpkin with Maple Bourbon Buttercream Frosting. Check back to learn more about the RTC and find out the verdict on the new Sweeties flavor. And now, the recipe for those wraps! Prepare the filling: Toast the mustard seeds by heating 1 tablespoon of oil in a large saucepan over high heat. Stir in the mustard seeds, cover the pot and leave the heat on high. When you start to hear the mustard seeds begin to pop against the lid, turn off the heat and wait for the popping to stop. Most of the seeds should be gray now. Stir the onions into the mustard seeds and cook over medium-high heat, stirring frequently, until the onions start to brown. Add more oil during this time if needed. 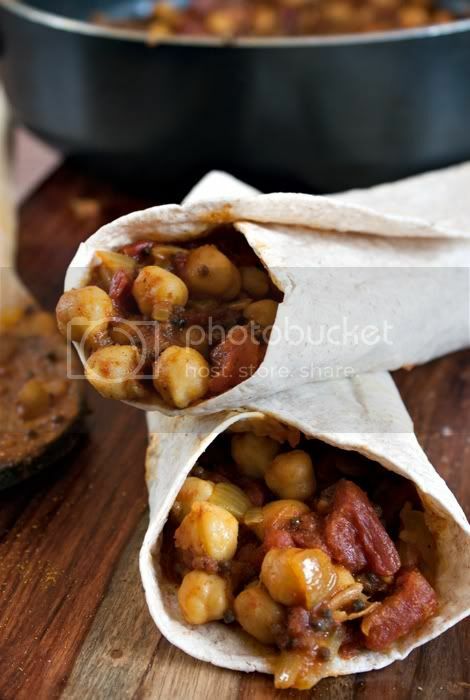 Stir in the curry powder, then add the tomatoes, chickpeas, salt, and cayenne to taste. Cover and simmer over medium heat, stirring occasionally, until the chickpeas develop a curried flavor (about 15 minutes). Add more curry and salt to taste, if needed. 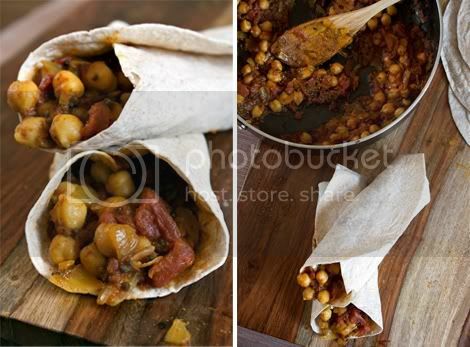 To serve: Mound the Chickpea-Curry filling onto 4 or 5 warmed whole wheat tortillas. Fold each tortilla as you would fold a burrito, and serve immediately.